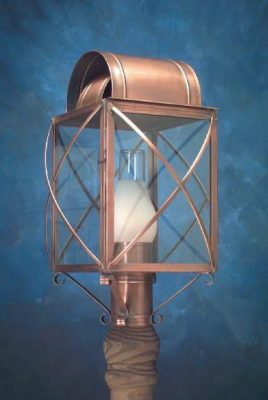 Hammerworks handcrafts Reproduction Colonial Post Lantern New Bedford Street Light 930BPC from Solid Copper. Especially relevant just as with Colonial Boston Post Lantern P103 these stately Colonial Post Lanterns are replicas of the original lanterns placed throughout their namesake city. Thus when the famous whaling capital was restoring their 18th century historical district, they partnered with Lighting by Hammerworks. We make the New Bedford street lantern with extra heavy gauge solid copper. The result is an imposing handcrafted Reproduction Colonial Copper Post Light made to withstand the harsh elements of the coastal climate. This Reproduction Colonial Post Lantern stands out among antique period post top lighting. As always you can pair this Classic Colonial Post Lantern with any of our handcrafted Colonial Wall Lanterns. Or perhaps consider Handcrafted Colonial Onion Wall Lights for a truly nautical look. Please note, New Bedford Street light is available in antique copper only. Most importantly we construct each Solid Copper New Bedford Street Post Light using the same methods employed by our colonial ancestors. Furthermore we hand rub the antique copper finish to give the light fixture an attractive satin patina. This will oxidize naturally over time. Of course if you prefer we can apply a custom verdigris copper finish to the Outdoor Copper Post Lanterns(1033p). In addition we will gladly paint the fixture black on a custom basis. Especially relevant we make each Reproduction Colonial Post Lantern with an industry standard 3″ post fitter. Thus it will attach securely to any of our Colonial Style Light Poles. In addition we supply the wrought iron steel cradle to add strength and stability to the Colonial New England Style Copper Post Lantern. While we equip Colonial Style Post Lanterns to accommodate up to 100 watts in a standard medium base socket you can opt to install a candle cluster instead. Choose from 2,3, or 4 candles, each rated for a maximum 60 watts per socket.